How many times do you come across a great activity and your mind is instantly racing with all the ways it could be applied to create more dynamic or student-centered learning? I had exactly this reaction to a Word Hoard activity shared by librarian and young adult author Megan Frazer Blakemore as part of the Teachers Write virtual writing camp for teachers this week. Teachers Write: Author Kate Messner is the co-creator and host of a fabulous “virtual writing camp” for teachers and librarians, called Teachers Write. Follow that link to Kate’s blog for more about the program and all the fabulous authors who volunteer to lead it. This is my second year participating. Word Hoards: Check out Megan Frazer Blakemore’s Thursday Quick Write prompt which shares how she first discovered Word Hoards, the uses she’s found for them and her writing prompt for exploring your own characters. You’ll also see the dozens of examples participants shared in the comments. What is a Word Hoard? Following Megan’s prompt, I used her activity as a way to more deeply clarify my understanding of 6 key characters in the novel I am revising. I immediately felt the value: to generate a word hoard for each character, I had to close my eyes and imagine myself fully inside that character’s skin. Shallow efforts would not have been meaningful: I emotionally wallowed down into each, letting details from the writing bring them into view. I imagined details of their backstory or the setting of one of their scenes or their history with another character or a particular possession or memory. My format: I could have done this in a journal or on a legal pad, but I do all my novel work in Word. In Word, I used the simple insert-table button from the toolbar to create a table 6 wide and 2 tall (1 column for each character, 1 row for their names then I listed the words in a second “row”; I could have made 10 rows, but this was simpler). See activities below for how students might vary formats. One at a time or all at once? I tried rotating through the characters, listing one word at a time for each. This was fun, as I felt the contrast as I went along, but it was inefficient going in and out of character (which would tempt someone not to take the time to get deep into character), so I finished the lists one character at a time. That pattern — one word each, then finish each character’s list — might be a good way to go, as you get the benefit of contrast and efficiency. Make it work: I let the list be shorter (say, 5 words instead of 10-15) for minor characters. An editor’s pass. Although this is a brainstorming activity, make your hoards powerful by going back when you’re done. Mark out words that aren’t that strong, or add definition to those that really resound. If I said motorcycle for my main character, I might add crash or the make and model of the bike his father raced, or one powerful sensory detail like the smell of oil. By the time I had 2-3 words per character, I could immediately distinguish clear differences between my characters. Each character’s word hoard revealed a very different voice and tone. One character wants peace, another wants action, one wants revenge, another to save the world. And the young son? Just wants to play with his cars. Clearly, the voice of each character would reflect that. relationships between characters — what does it reveal if a character says he wants peace but falls for a woman who wants action? how might a son who just wants to play with his cars be impatient with a mother obsessed with solving a crisis? Extend this to the world around them: how will the character who wants revenge be punished or judged? setting — what elements of time or place impact the words in your character’s hoard, or how are the story’s time or place obstacles to the character? other details — writing settings and details is not just about painting a picture, but about revealing the filter through which each character sees the world. How does each character’s hoard suggest the kinds of objects or details that character would notice? Add those. Considering how fun it was to watch my character word hoards take shape and how deeply they pulled me into understanding character, I immediately envisioned ways to use hoards for fun literary activities. In pairs, students call out or reveal one of their words at a time, taking turns. Goal: see who can guess the other’s character first. When finish, trade partners with another group, working around the room for as many cycles as desired. Small groups could face off against each other, similar to the game for pairs, keeping score to see which team could identify the most characters. The same thing could be done whole-group, for reading groups needing closer modeling or review. Individual Practice. As an alternative literary review, students work independently, creating a T-chart or other graphic organizer with space for each major character in a literary work. Students then either brainstorm their own words from the minds of characters, or identify the actual words used by the author to signal the distinctive characteristics of each. 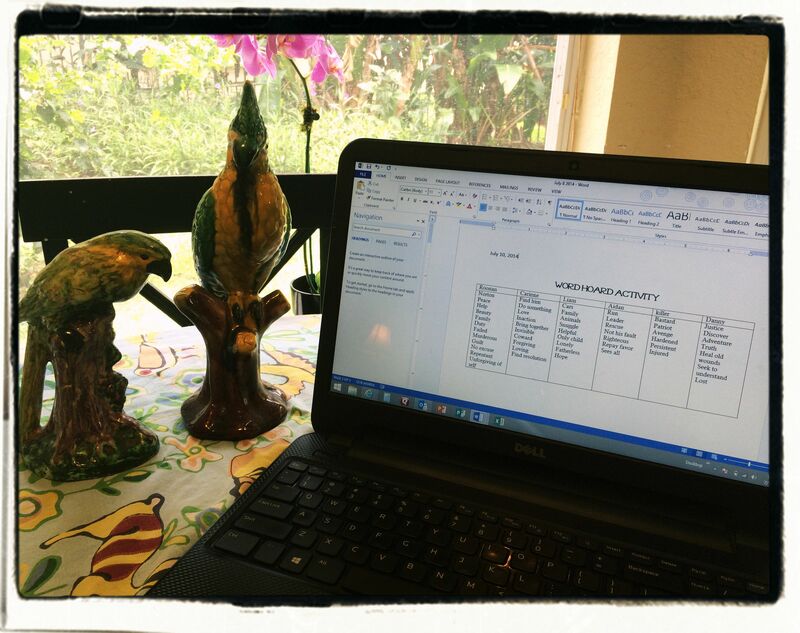 Organization for literary analysis. Student creates a graphic organizer as a brainstorming step prior to writing a literary analysis that evaluates a single character or compares different characters from one or more works. The student can evaluate the power of the words in their brainstorming: weak words can be crossed out. Really powerful words might be highlighted or circled, and the student might look for quotes from the text to illustrate them. Arrows or other relationship signals can be drawn to develop connections that might be made during their analytical essay. These relationships can be numbered, to begin organizing them into paragraphs. Ultimately, the word hoard should generate character-specific and revealing word choice to be used in their analytical writing. Creative fun in interactive reader notebooks. Word hoard lists might be a menu alternative for interactive reader’s notebooks. I am a huge fan of the participatory nature of interactive notebooks. Rather than in a structured list or chart, hoarded words could be written in illustrative fonts, circled in concentric ripples, written in colors, illustrated with doodles, drawn with icons indicating relationships between other hoard words or other characters, illustrated in ways that connect the character to setting or other literary devices, or just reveal the fun and excitement the reader feels about the book or character. This kind of an interactive notebook page could be taken further with flaps, envelope pockets, or other 3-dimensional options. I also happen to be a history teacher and could see these same activities being adapted to play with famous historical characters. 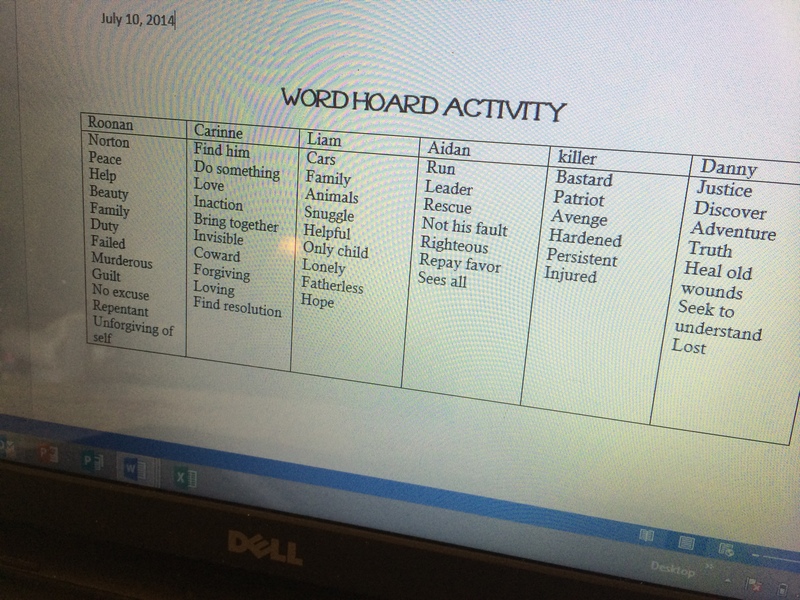 Add a word hoard to a lapbook on a famous explorer. Use the who am I? game above to review important people at a unit’s end. Use the same process of organizing for literary analysis to compare key figures when writing an essay comparing inventors or political figures. If you have been participating in Teachers Write, do say hello in the comments here. How have the prompts been going for you, or what inspiration have you found? Summer is a great time for brainstorming and expanding our professional learning networks. What resources or a-ha moments have been most revealing for you? If you like this blog, be sure to subscribe using WordPress’s follow option or via email. I love to connect with other educators and writers. Well, first of all, this is just an amazing lesson plan. I’m humbled that this grew from the Quick Write. I love this plan. Applying it to historical figures is especially interesting to me. When I was writing The Spy Catchers of Maple Hill I did a lot of research into the slang of 1953. That could be another interesting aspect of historical exploration. Not just slang, but also what objects, etc. might influence their word hoards? Megan, thanks! I’ve said elsewhere that it is a deceptively simple writing activity that can generate so much. For my novel revisions, seeing the difference in tone for each character even helped me with drafting a query pitch and understanding revisions needed to tighten structure — which makes sense, since each character’s hoard helps define the intersections of internal and external motivation. I love your observation about historic characters! I’ve been through a similar issue of setting as I often write in other cultures, so find myself gathering expressions, brand names and other odd cultural details. It made me think, as I was working in Scrivener today, that we could create the word hoards as a character file — collecting words as well as those historic objects and slang. What a great resource these lists become — no different than a cook reaching into a pantry, right? 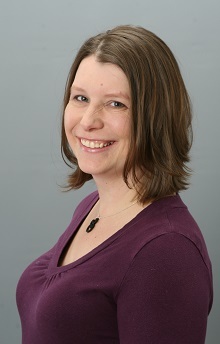 Thanks so much for giving your time and ideas to Teachers Write, and for visiting and connecting here. By the way, I heard great things from one of our participants who’s drawn in by chapter 1 of Spy Catchers of Maple Hill – I look forward to reading! Loved your extension of categories in hoards and applications in classroom! Thanks, Libby. I swear, I keep coming up with more specific applications and several others shared a few in comments on the TeachersWrite Facebook page — like, for a group activity, students could use apps to generate and display group word hoards in real time. The app I’ve used that would work for that on laptops, ipads or iphones is Socrative. I liked reading on your blog (http://bit.ly/1jk6JBC) how you’ve used this week’s prompts to write poetry! Great job! This was a wonderful post. The details creative lesson plans are so helpful. I work as a volunteer providing extension projects for Gifted students. These ideas will make great projects for students. That’s great to hear. I was definitely thinking that some of these activities would be good ways to offer extended learning for AP, gifted or advanced readers or writers. I’ve had a pet project of wanting to have an arsenal of challenges ready to offer them, and I think you’re right – these would be good projects for them. Thanks for commenting! This is awesome! Thanks for sharing this! I like how you extended the prompt, too, and how thoroughly you describe it here. I’m definitely going go to try this for my characters before I go much further with this new draft! Thanks! Jen, thanks for reading and commenting. I’ve actually meant to also share this activity on my writing site, with more specific emphasis on how I used it for the novel. It was fascinating to me how such a seemingly simple activity helped me clarify some really complex revisions (plot, structure, pov, inner/external conflict) I had been working on. Reducing the characters down to words they would choose really helped me focus the work! 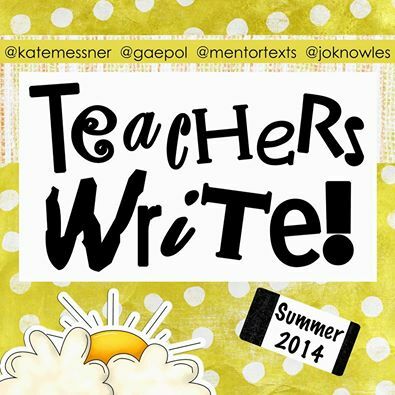 Nice to see you here — thanks for commenting, and I’ll see you back at Teachers Write!